The 2010 edition of Kraft Hockeyville arrived in Dundas, Ontario, on Tuesday, providing a major bright spot to what was otherwise a rainy autumn day in the small town about 75km west of Toronto. 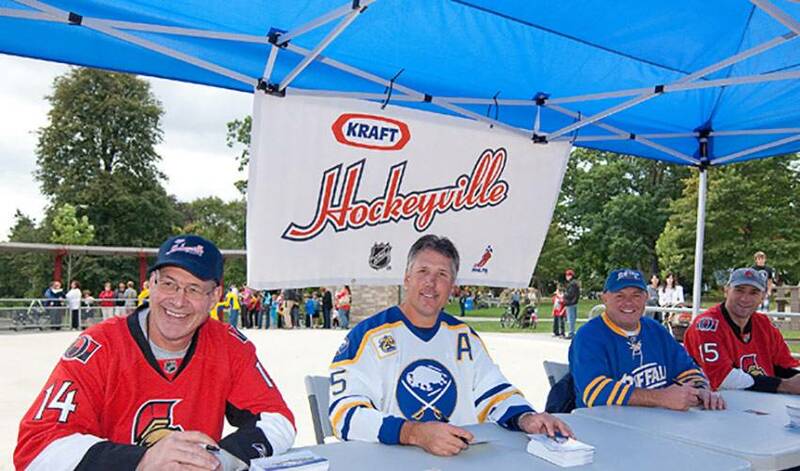 Having won the honour of hosting the event through a Canada-wide voting process, Dundas became the fifth Canadian city to be named Kraft Hockeyville, joining Salmon River, Nova Scotia; North Bay, Ontario; Roberval, Quebec; and Terrace, British Columbia. The NHLPA's Goals & Dreams fund was also in Dundas for the day, making an equipment donation of 30 full sets of gear, valued at $15,000, to local children. The donation was split between the Dave Andreychuk Foundation and the Rotary Club of Dundas. After the Sabres practiced on the J.L. Grightmire Arena ice in the morning, Buffalo defenceman Steve Montador met and chatted with a group of kids in a downstairs dressing-room to present the donation. He also took the time for some pictures with the kids and signed some jerseys for them as well. Four lucky Dundas schools were also able to reap the benefits of having some NHL players in their town, getting visits from players of both teams. Dundana Elementary, Highland Secondary, Parkside High School and Sir William Osler Elementary were the lucky recipients of the player visits, having their questions about the life of NHL players answered by Ottawa's Ryan Shannon, Brian Elliott, Jared Cowen, and Erik Karlsson; as well as by Buffalo's Drew Stafford, Steve Montador, Nathan Gerbe and Tyler Myers. The NHL Foundation also announced a $15,000 donation of their own during the day, allocating the money to the “Gotta Be Dundas Legacy Project”, which will go towards the efforts of the community to upgrade J.L Grightmire Arena. “The NHL is pleased to provide support for the Gotta Be Dundas Legacy Project and the initiative to refurbish the J.L. Grightmire arena,” said Kyle McMann, Director of NHL Integrated Marketing.